You love your favorites—you’ve spent hours here sifting through new music, and these are your gems. We know you prize them, and want to keep them with you wherever you go. Beginning today, you can sync them to a private playlist on SoundCloud! We’ve been working with SoundCloud for many years to help you discover new music, and this partnership makes the connection even easier. Link your accounts to get started. This doesn’t seem to be working, I use the link to connect with soundcloud, i authorize, then i return back to the page where it asks you to connect, as if nothing happened? I don’t see an extra playlist or anything.. 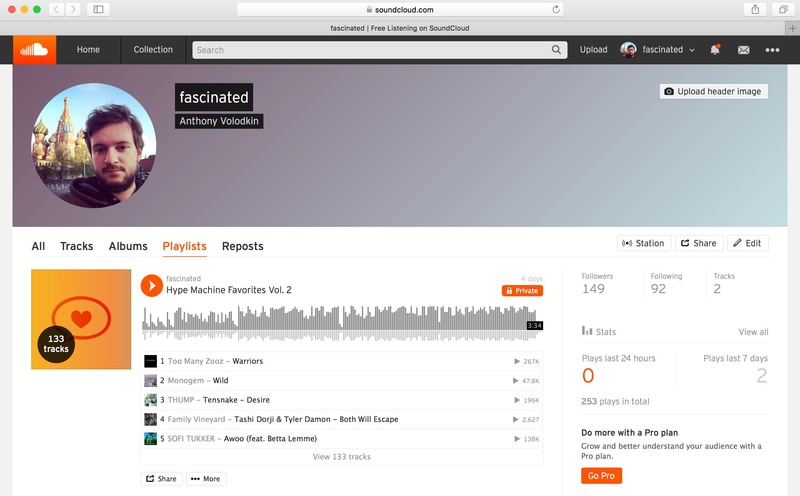 I also cannot seem to find my Hypem playlist on Soundcloud, after signing up on SC and syncing the two (from the hypem link). This sounds like a great idea, btw. sloes, can you load hypem.com/link-sc again? It should correctly show your linked status. James, usually the playlists are made as “Hype Machine Favorites Vol. 1” and etc. Email us via hypem.com/contact if something is off. Since Win10 phone app stopped working, this is a godsend :D! It would be nice if this also adds a “like” on Soundcloud, as a thank you to the artists. @JK, we’ve considered this, though it can make things in someone’s SoundCloud account rather messy, if you have a lot of Hype Machine favorites and you are used to listening to your SoundCloud likes too. @Anthony I guess you’re right, I wouldn’t know because I only listen on Hype Machine. Hello guys, just wondering, this will ONLY create a new playlist, not sync/import favorites from one site to anther? I respect each platform for what they are and I wouldn’t want to have favorites where they are not supposed to be. Thanks! Julio, that’s correct. It only creates playlists, and doesn’t touch favorites/likes. This is truly unfortunate… I’ve been a loyalist to Hypem for years and this is heartbreaking, but expected in a world run (inevitably) by the bottom line. I wish there was some way I could spend $20 or even $50 as a subscription or one time fee to not see ads. For now, I’ll hold off on updating as long as I can. I am not a SoundCloud user. I’m really struggling to understand what the advantage of this is for me? Why is the ability to sync my favorites to SoundCloud worthy of losing the offline mode in my app? What’s the tradeoff I’m getting here? I’m honestly wanting to know what your reasoning is here? By taking away offline in the app, what did you (SoundCloud) give me in return? In what way does this decision make my experience with Hype Machine better? Very disappointed that there is no longer an offline favourite list. Was my favourite feature of the app. Gone. I don’t think this was anyone hypem’s decision. SoundCloud go wants to force you to pay them $10 a month for a service that we had the novelty of utilizing free with the hyped app.